For added versatility, the Thunderbolt 3 adapter can be used to connect two DisplayPort channels to a single 5K display. 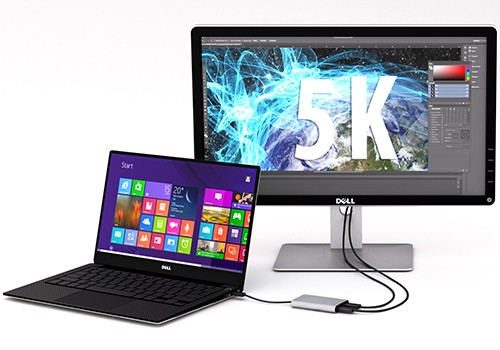 Using a Thunderbolt 3 adapter is the only way to connect a 5K display to computers that don?t have multiple DP or Thunderbolt 3 ports, such as your Dell Precision 15 3000 Series workstation. Functioning as an external 2-port graphics adapter with audio support, this is a compact and convenient alternative to a laptop dock, when you don?t need full docking capability. Because it?s backward compatible with your high-definition 1080p displays, this is a great accessory for home, office or other desktop workspace applications. For an up-to-date list of affected computers and instructions, visit http://thunderbolttechnology.net/updates. If your manufacturer isn?t listed on the Thunderbolt website, contact your manufacturer. Note:? If you're using a video adapter to connect this device to a monitor other than DisplayPort, such as HDMI or VGA, an active video adapter is required. Note: The adapter can support 5120?2880 (5K) when both DP outputs are connected to a single monitor that supports 5K.